On tap – in the office. I mean really what’s not to like? We are thinking of installing one of these for Christmas. It must be one of our five glasses a day surely?! Seriously though, after those two Russian multi-millionaires went head to head recently in a three hour spending war to see who could amass the biggest bill in an exclusive London nightclub (Kitsch) we think this could make perfect sense. The pair, who the club have chosen not to name, racked up bills of £66,778.91 and £64,279.70 respectively by ordering bottles of vintage champagnes. They should install one of these in the club instead! Our lovely friends at Rococo will be exhibiting their fabulous artisan chocolates at Olympia this week. Salon du Chocolat, the world’s largest chocolate show is coming to London. This spectacular finish to a wonderful line up of Chocolate Week activities takes place 18th-20th October at National Hall, Olympia. We are intrigued by the Salon’s world famous chocolate fashion show with stunning couture outfits made and inspired by chocolate, designed by the countries top chocolatiers and some of the UK’s most exciting fashion designers. The outfits will be worn live on the catwalk at the Gala preview evening for the show and displayed throughout the event. Chocolate you can wear?? Where do we buy?! Hats off to the kitchen garden crew at Lainston House Hotel for this amazing effort! 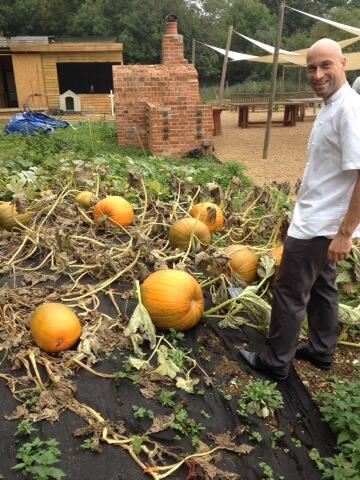 These pumpkins will be the basis for some incredible seasonal dishes, courtesy of Lainston’s brand new chef, Olly Rouse. Olly will be overseeing all of Lainston House’s food and beverage offerings including the award-winning Avenue restaurant (3 AA rosettes). Olly brings a wealth of experience; he was previously Head Chef at Coworth Park where he helped achieve a series of accolades including a Michelin star within its first year of opening and 3 AA rosettes. He’s also done some time at infamous The Fat Duck so we are expecting some seasonal treats from their first class garden with a new twist! We visited Lucknam’s fabulous cookery school a couple of weeks ago (read the full review here) and had a whistle stop tour of their spa facilities where we were shown their newly opened inspiring Well-Being House. One therapy in particular has resonated with us and as the weather gets gloomier, duller and wetter this has now found a firm place on our wish list! Haslauer Reflective Sunlight Therapy replicates the change of light from sunrise to sunset, creating the feeling of a warm summers day bathing you in light and offering vital vitamin D production. The experience is restful but revitalising, stimulating the metabolism. At £30 for 40 mins it may become a weekly must have! Find out more at http://www.lucknampark.co.uk. Next articleLifestyle ArticlesShould restaurants offer a 'soft drink' pairing along with their wine recommendations?